If you teach writing workshop, then chances are you value student independence. You encourage kids to solve problems on their own, do their very best work, choose their own topics to write about, and to work at their own pace. For the most part, kids will improve as writers by practicing writing themselves. However, there are times when kids might need a little extra scaffolding. 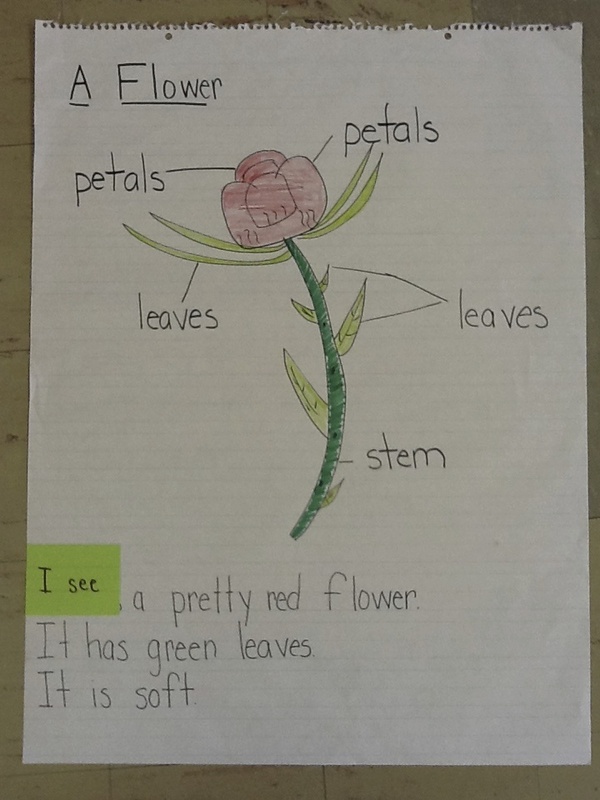 Shared writing can support their work in a variety of ways. Simply put, shared writing is when the kids come up with the ideas as a group, and the teacher does all or most of the actual physical writing on the page. Most often, shared writing happens on chart paper or on a SmartBoard, so that the whole class can work together on a story (or essay, song, poem, or any kind of writing). But shared writing can also happen in small groups, or even one-one with a student on smaller paper. Shared writing is not the same as independent writing, and it doesn’t take the place of it. But it can be a helpful method to use a certain points in a unit, and with small groups of students. How does shared writing go? There are many ways that shared writing might go, but after lots and lots of practice, I have found myself following a pattern. We meet in the class meeting area so that all the kids are close to me and the easel I’m using for writing (this is across the grades K-8). Kids turn and talk to a partner about their ideas. I move around the meeting area, listening in on kids and gathering ideas. As I move around, I briefly coach kids to be active listeners, and to lift the level of their storytelling. Again, kids turn and talk. I listen in and coach again. Again I gather ideas by listening in. I convene the class. I share what I plan to write. “I heard one of you say…” and then I write it as quickly as I can. I move on to the next sentence or the next page in the same way. I ask kids for ideas, they turn and talk, I coach, and I write what they said. This pattern works for any genre or type of writing, I just change my prompts accordingly. Shared writing doesn’t take the place of the usual writing workshop–it’s in addition to it. I don’t usually call on one kid at a time (I use turn and talk instead). I try not to spend an inordinate time with just one partnership—I try to move around. I don’t try to make their storytelling perfect. I coach briefly, and then accept their approximations. I don’t spend a long time on only a tiny bit of writing. The children are engaged and involved in telling the story (or essay, song, poem, or other kind of text). I restate/scaffold children’s language by modeling rich language and coach them when they storytell. This kindergarten teacher created this information book with her students by asking them to decide what she should write on each page. They were also working on writing pattern books, so you’ll see that she’s coached them to use the same pattern across the pages. When students in this classroom went to write their own information books, they knew just what to do to get started, because they had already written several as a class. 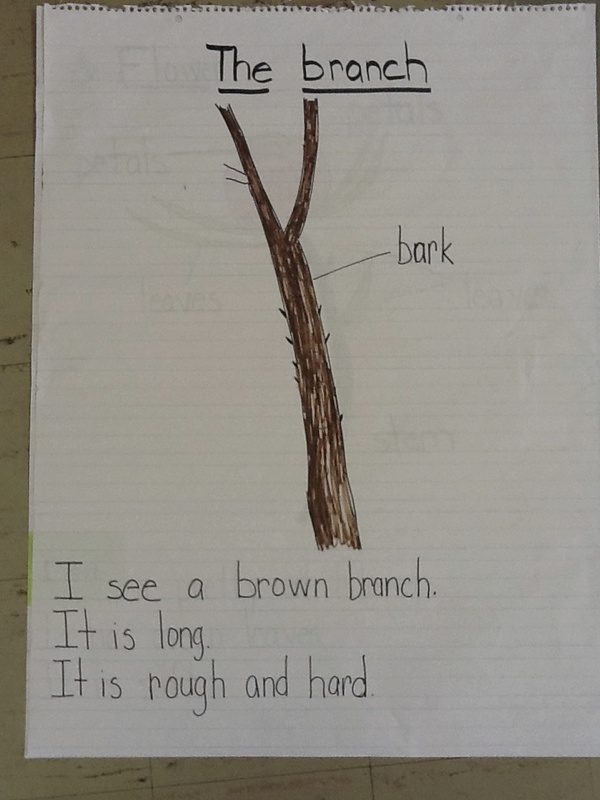 You can see in the above example that all of the writing was done by the teacher (you can tell by the handwriting that the kindergarteners did not write the words). The kids did help with the pictures in this case, but that might not be the case in every piece of shared writing. With older students, there might not be pictures at all–the shared writing should mirror what the kids will be doing on their own. How long does shared writing take? One session of shared writing usually takes me about ten minutes, fifteen tops. I find that engagement is highest when ideas are fresh and the pace is moving along. It’s easy to get sucked in and wind up spending half an hour—time that I just can’t afford when I think about all the other things I would like to do in a day. I also find that splitting shared writing into smaller chunks and revisiting it daily gives kids time to think about our piece across days, rather than all in one-shot. Writing in front of the kids can take a while, especially if you’re working with older kids and you want to model writing with lots of detail and elaboration. Occasionally I might say to the kids, “Is it okay with you if I take this home and finish up this part using the great ideas you gave me? I’ll share it with you tomorrow so you can make changes to it.” This speeds up the process a bit so that we can have a complete piece of writing in a matter of days, rather than weeks, while still ensuring that the kids feel ownership over the text. It’s their story after all, not mine. What’s the difference between “shared writing” and “interactive writing? My colleagues and I at TCRWP refer to shared writing when we are talking about creating a text together with the class (or small group), and the focus is on the kids coming up with the ideas and language. The teacher does the physical writing. 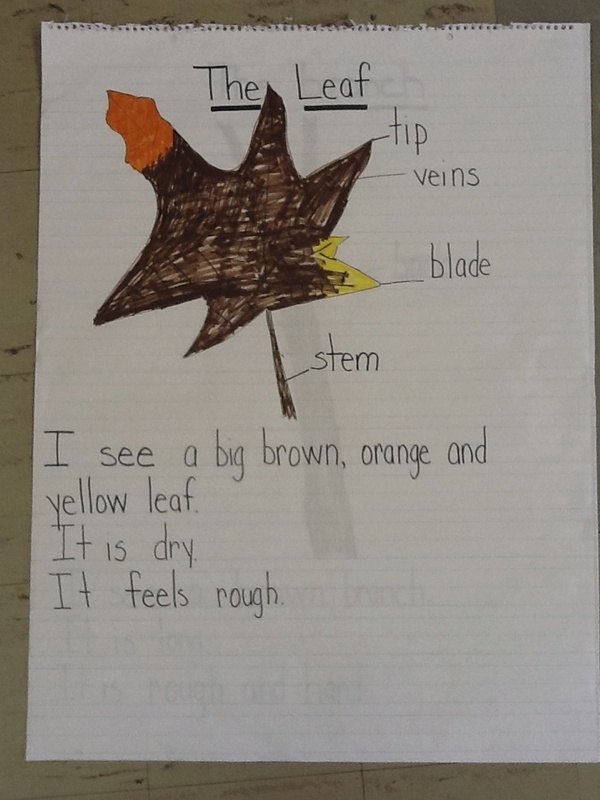 Shared writing takes kids through the entire writing process together through oral storytelling: from gathering ideas, to drafting and revising a complete piece. By rehearsing ideas aloud, kids are getting lots of practice with language—they are able to rehearse an idea multiple times in a relatively small amount of time when compared to the time it may take to write. For some kids, oral language/rehearsal is their preferred mode or learning style while others struggle with sharing their thoughts verbally. Shared writing helps you reach those verbal kids who need to and like to talk in order to think and understand, while at the same time supporting the kids who are less comfortable and need extra practice in the speaking and listening department. On the other hand, we refer to interactive writing when the kids come up to the chart paper and actually do some of the physical writing on the page. Some call this “sharing the pen” or “guided writing.” In interactive writing, the goal is to coach the kids to write a conventionally sound text—spelling, grammar, and mechanics are front and center. These pieces of writing tend to be shorter so that each spelling pattern or grammatical feature can be discussed along the way. 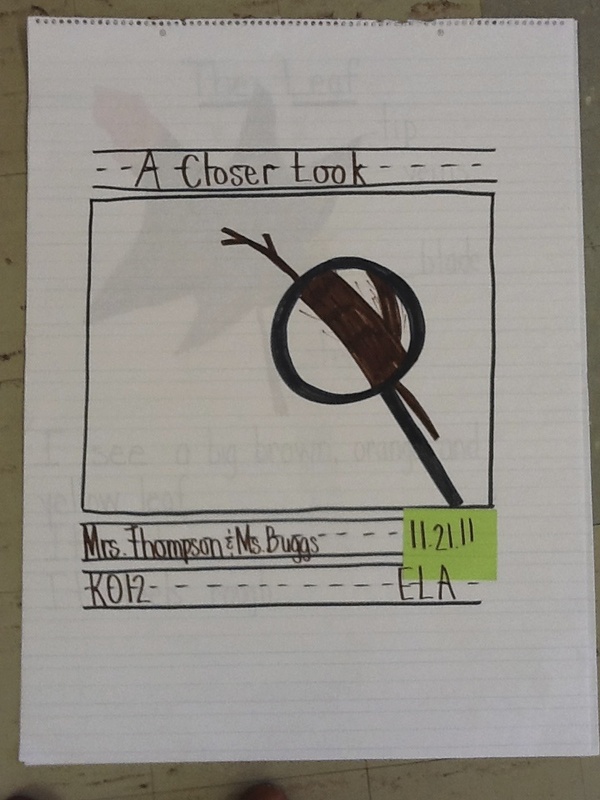 In grades K-2 an interactive writing text might only be a one-word label, or a sentence that states the classroom news of the day. In grades 3-5 an interactive writing text might be a bit more than that, but still pretty short. I highly recommend the book Interactive Writing by Andrea McCarrier, Irene Fountas, and Gay Su Pinnell if you’re interested in learning more. You can see that the teacher wrote most of the words, but students wrote the initial consonants, G, T, F, and T. In the process of creating this text, the teacher discussed capitals/lower cases, apostrophes, spaces, listening for the first sound in each word, and end punctuation. Of course, sometimes I might add a sentence or two to a pre-existing shared writing text, using interactive writing—but that’s getting fancy. 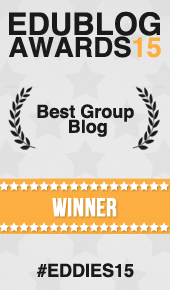 What is shared writing good for? Additionally, early stage English Language Learners especially benefit from the shared experience of creating a story together before being expected to go off and come up with the language to write a story from scratch. In a unit of study on personal narrative, for example, your class story should be about something that the whole class experienced together so that they can all contribute something to it. Then, when it is time for kids to write their own stories, there may be a few individual students who decide to write the same story that was told as a class. For students who are just learning English, using the class story idea and then putting it into their own words is a nice scaffold—one that they will grow out of as they learn more and more vocabulary. Lastly, for very reluctant writers—I mean, EXTREMELY reluctant writers—the kid who will literally sit for the entire writing workshop day after day without writing anything. Sitting down one-one and starting a shared piece of writing together isn’t a terrible idea. The student comes up with the words, you write it down. Don’t kid yourself into thinking that this counts as independent writing–it does not. But it is better than nothing and it might help a student get over the toughest part–taking a risk and getting started. It also might help forge a more positive relationship between you and the student, and more confidence about writing in general if the student likes what she/he sees once the words are recorded on the page. Perhaps you start out by writing down the first page or two (depending on the age and needs of the student), and then they finish it. Then the next time you only write a few paragraphs. Then finally you only write a sentence or two. In this way you can gradually release responsibility to the learner, and give them a little boost to get over whatever hang-up is keeping them from getting going. While shared writing can never take the place of giving kids time and space to practice their own writing, you might find that it can play an important role along side your minilessons, conferences, small group work, and all the other important methods you have in your teaching repertoire. 1. What do you think? Does this match what you thought shared writing was? Or is this different than what you had heard in the past? 2. Do you use use shared writing in your classroom? When do you use it? When do you not use it? Please share your thoughts and comments below. Let’s have a conversation! I’ll certainly share this with those teachers I work with. It will be valuable to them when they work with their students. I love the explanation of the reasons why particularly. Thanks! What a clear description! I often use shared writing as my shared reading in K as kids are apt to hang onto patterns and texts when they co-author them. Great post! I love composing shared writing that become shared reading in kindergarten. The kids hold into a pattern or a story in a different way when they helped to write it! Great post. this was a very helpful post, I would love to see a continuation with a post on interactive writing. I have used shared writing in reading workshop when students learn to write reading responses, sometimes during poetry writing, but not much for narrative or expository writing. I am rethinking my practice after reading this post. This is an INCREDIBLE post, Beth! I was just chatting on the phone with Tara and we both agreed that this post is like everything one needs to know to get started with shared writing. Thanks for the mini-course! Thanks Stacey! I have so much more to say on this topic! It was hard to keep it reigned in! Oops I meant to say Shared Writing not Guided Writing. Thank you so much for giving us a short little lesson and more ideas of how to help our students be better writers. I use turn and talk during math a lot. During Guided Writing or any other kind of writing time with a group it provides a safe environment for students to share their ideas rather than in a whole group situation. This post couldn’t have come at a better time. Thank you. Oral language and vocabulary are such an important part of every discipline. Glad to hear you’re giving your kids plenty of opportunity to talk during math. You can definitely use shared writing as a method in math as well — writing out the steps to how solve certain types of problems, for example. I can’t wait to share this article with others! Thank you for crafting such a teacher friendly description of shared writing. You are welcome Lori! Please share widely!